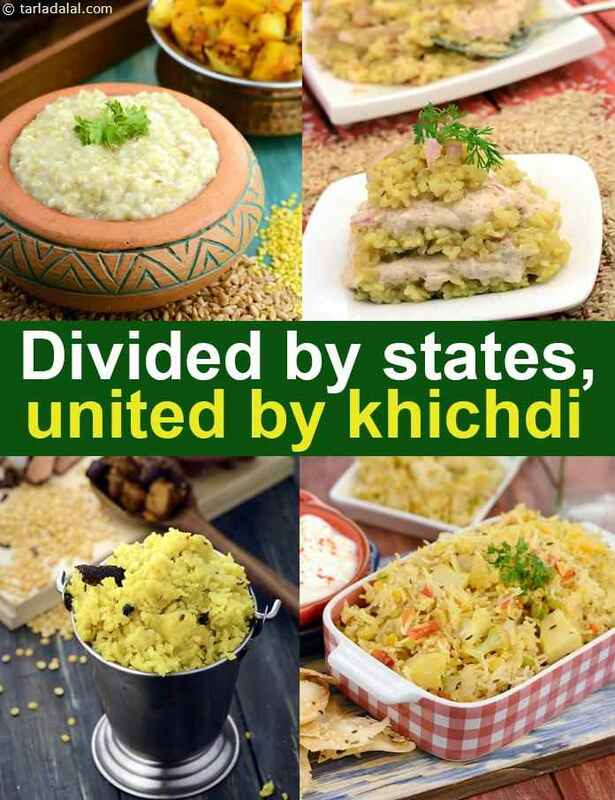 Khichdi is not really beemaron ka khaana, it is now our national food ! The first food that most Indian’s learn to make while travelling to abroad for studies, has to be khichdi as it’s the real comfort food. The mesmerizing combination of dal and rice, cooked to a mushy texture is a perfect delight that will soothe you. You can use different varieties of dals, add some spices or vegetables to enhance the taste. To make it more healthy, somedays you can substitute rice with millets, broken wheat or brown rice. They are simple to cook, and can be made in a pressure cooker when in a hurry. Khichdi is a humble, one-dish meal and fits perfectly into any meal, be it lunch or dinner. Khichdi ke chaar yaar – dahi, papad, kadhi aur achaar is rightly said! You can even serve rasawala shaak (i.e subzi with little liquid/gravy) . Onions pounded freshly with the palm or garlic chutney are also some popular accompaniments. From simple khichdi recipes to unique preparations like the Dahiwali Moong Dal Khichdi and Bohri Khichdi, these Khichdi recipes features myriad textures, flavours and colours, making it a delight to behold and relish. Moong dal khichdi and Toovar dal ni khichdi are the most satiating and common Khichdi preparations. Served piping hot with a drizzle of ghee will comfort you after a tough day! To try something different from the regular, try adding grated doodhi or gajjar and sauté some whole spices to make this Wholesome Khichdi. Palak Khichdi mildly spiced with masalas and perked up with spinach puree makes a complete meal because it is so self-contained in terms of flavours. Masoor Dal and Palak Khichdi is another similar delight which includes healthy spinach and energy-giving potatoes along with simple spices. Oats Moong Dal and Vegetable Khichdi, Brown Rice Khichdi are some healthy delicacies when served with a bowl of low-fat curds. They take hardly any effort and are some simple variations that you must try!